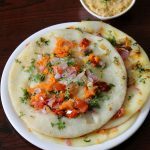 Rava uttapam is another interesting rava pan cake recipe which is made very instantly and it is a very healthy breakfast recipe that can be served with any dosa chutney or idli chutney. 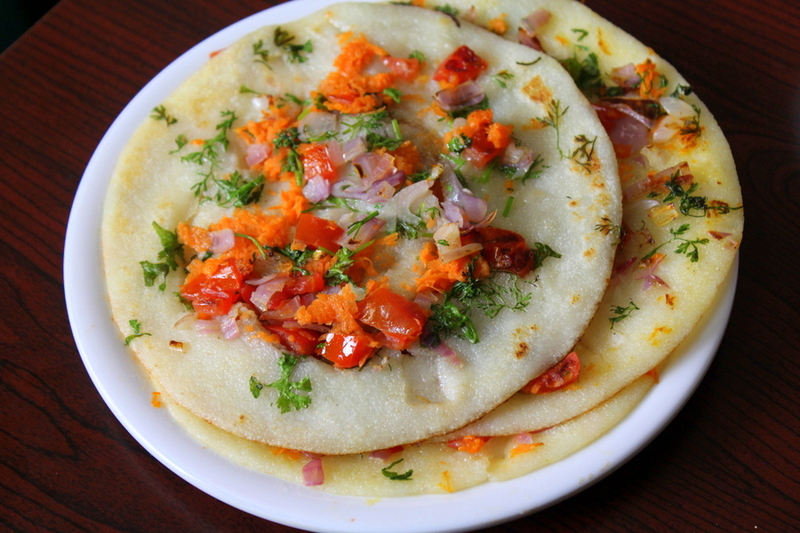 Rava uttapam is shared along with a video procedure below. Uttapams are similar to dosa recipes but the difference in making uttapam and dosa is nothing but the thickness. To make uttapam, the batter is spread in circular motion and it is spread thickly and to make dosa, the batter is spread very thin just like a paper form. To make any uttpam, the topping is the same. Here, this is not an ordinary uttapam, but it is a rava uttapam and it made out of sooji/rava. The batter is made instantly and the uttapams have turned out absolutely delicious. I have made it for the first time and have really liked this instant breakfast recipe which is suitable for kids as well as young who are in a hurry to go to schools and offices. This instant breakfast idea is healthy as well as quick to make. The batter to be made is quite simple and all the ingredients required to make this instant rava uttapam batter are very simple and basic. However, the main ingredients to make instant rava uttapam are yogurt and rava. These two give a very delicious taste to the uttapam. The batter made here is with the help of rava, yogurt, salt, baking soda and some water. The batter should not be too thin and thin batter is required to make rava dosa but to make rava uttapam, the batter has to be thick. I would like to add many more uttapam recipes and dosa recipes and among them would like to also post their instant and quick versions. 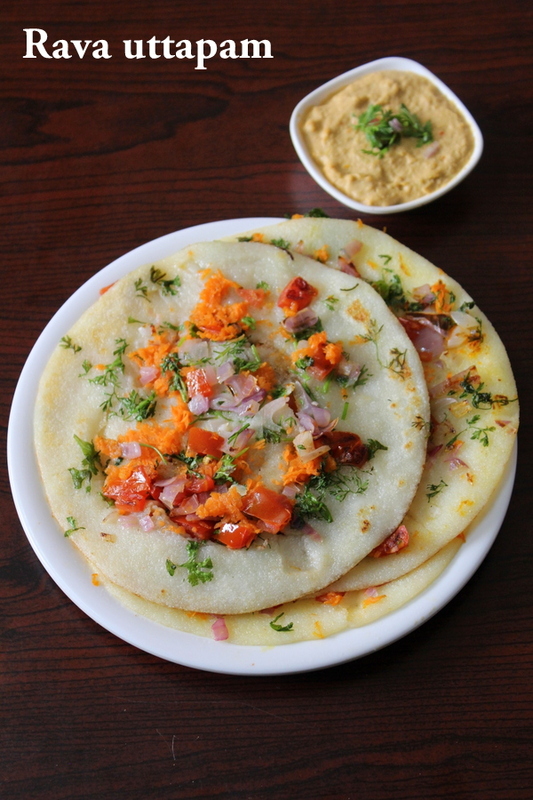 These uttapams can be served with chutneys like green chilli chutney, peanut chutney or groundnut chutney , pudina chutney or any idli dosa chutney. A quick and instant uttapam recipe made using sooji/rava and yogurt. Firstly, take a bowl, add rava, yogurt, salt, baking soda, water, mix all the ingredients well with a hand whisker. Mix the batter without lumps and make sure the batter is not thin and it has to be slightly thick. Let the batter sit for 15-20 minutes. Mix the batter well again. Take a griddle or a tawa, heat it. Brush oil all over the tawa. Take an onion slice and wipe all over the tawa. Take a ladle full of rava uttapam batter and drop it at the centre and spread in circular motion until we get a small round pancake. Add finely chopped onions all over the uttapam. Add chopped tomatoes all over the uttapam. Spread chopped coriander leaves all over the uttapam. Similarly add grated carrots all over the uttapam. Also add very finely chopped green chillies too but can be skipped if one is making it for kids. Sprinkle salt accordingly on the vegetable topping. Smear oil around the corners of uttapam and all over on the uttapam. Cook the down side for about 2-3 minutes on low flame. Flip the uttapam very carefully and cook the other side too for a minute. Flip again and cook for few seconds. Take the uttapam out on a plate. Continue making rest of the uttapams in a similar manner. 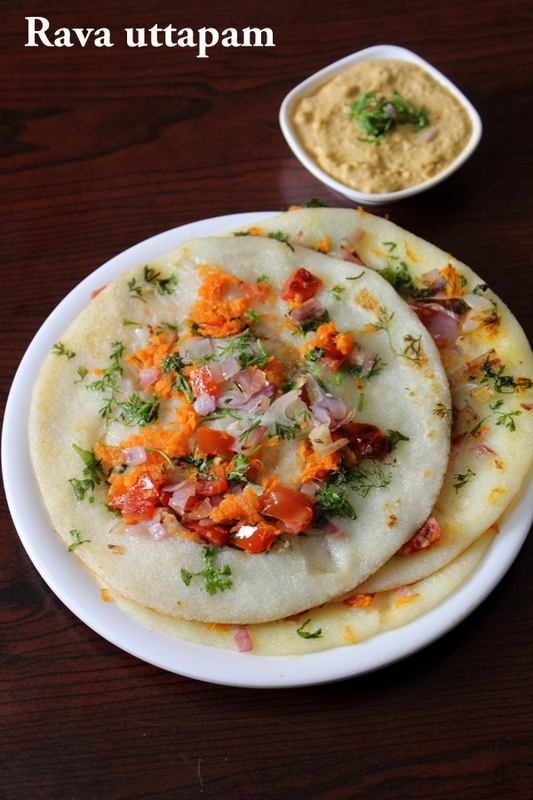 Serve the uttapam with idli or dosa chutney. 1. Do not attempt to make big uttapams as the batter might break after dropping on the tawa and when spreading it. 2. Always while making uttapam, the size of the uttapam should be maintained very small and thick. 3. Topping quantity can be increased or decreased as per one's choice. 4. Less topping or more topping can be adjusted as per our own desire. 5. If uttapam is being made for kids, then try to avoid chopped green chillies as they may be too hot for them to eat. 6. Allowing the batter to rest for few minutes help in getting perfect uttapams and therefore if one has time to let the batter sit for few minutes, it is a better option to obtain tasty uttapams.